For the Frenchman, today was his first ATP singles final since his triumph in Eastbourne in 2010. Last week, Llodra and Del Potro clashed in the first round in Rotterdam with the Argentine prevailing in a tough three setter. Consequently, Del Potro would have his work cut out for him. At 2 all, a backhand crosscourt pass winner gave Del Potro his first break point. However, Llodra recovered by striking an ace and eventually held for 3-2. Later, as a result of a forehand volley miscue by Llodra, Del Potro had his second break point chance of the opening set. 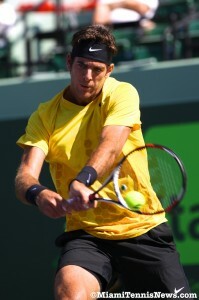 When Llodra misfired on his second consecutive forehand volley, Del Potro sealed the break for a 5-4 lead. With a quick service game, Del Potro closed out the first set. The lefty, serve and volleyer did his best to trouble Del Potro. But, the Argentine’s dipping strokes made it hard for Llodra to be consistent with his volleys. In the second set, because of interference on a volley by the net cord, Llodra stared at break point. With the Frenchman’s backhand volley going wide on the subsequent shot, Del Potro gained a 3-2 advantage. 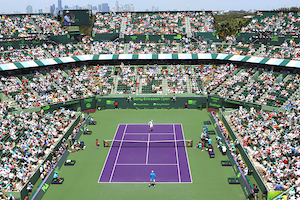 After Del Potro comfortably consolidated for 4-2, Llodra faced triple break point. Somehow, Llodra shoveled himself out and dismissed a fourth break point before guarding serve for 3-4. With Del Potro serving for the match at 5-4, a double fault and backhand pass landing wide gave Llodra hope. For the first time, Llodra was ahead 0-30 on his opponent’s serve. Still, despite Llodra’s valiant effort, he could make no inroads on his rival’s serve. The Frenchman failed to manufacture a sole break point the hole match. With three good serves, Del Potro reversed the tides to get to match point. When Llodra dumped a forehand into the net, Del Potro seized the set and the championship. With this victory, the world number ten maintained his unbeaten mark against Llodra (3-0) and banked his maiden indoor trophy. Moreover, Del Potro improved his record this year to 13-3, reaching the quarterfinals or better in all the fourth tournaments he has participated in thus far.